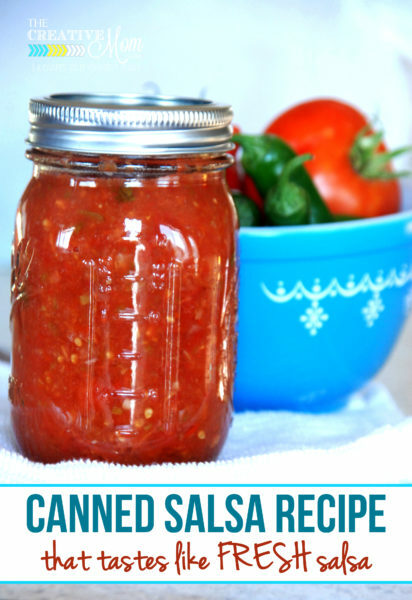 I’m so excited to share my favorite canned salsa recipe that tastes like fresh salsa! This canned salsa recipe is tried and true. I took a few different recipes I liked and mixed them together and subtracted some things to get the mother of all yumminess in a bottle. 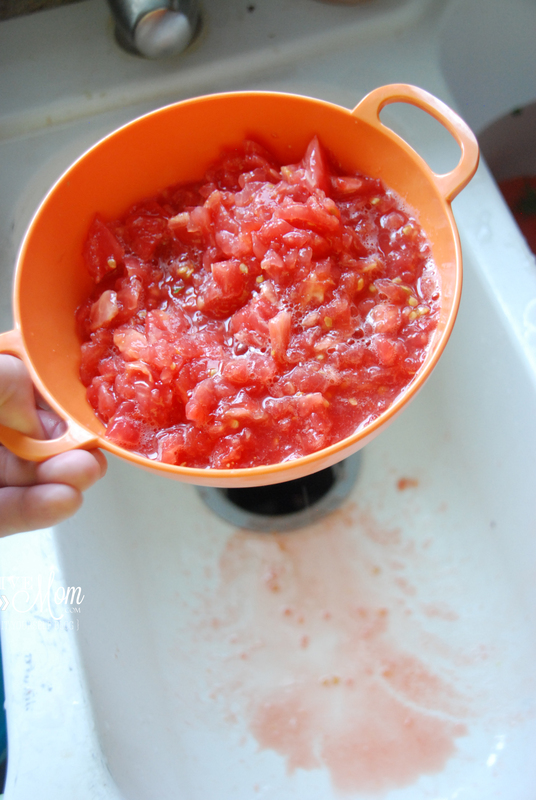 Trust me when I say that this is the PERFECT salsa recipe for canning. This recipe is for a mild-medium salsa. You can make it spicier by adding more jalapenos… or milder by seeding your peppers, or taking some out all together. This canned salsa recipe makes about 12-15 pints. If you don’t want that much salsa, or don’t have that many tomatoes and peppers on hand, go ahead and half it. All of these ingredients in this salsa recipe can be adjusted to your liking. 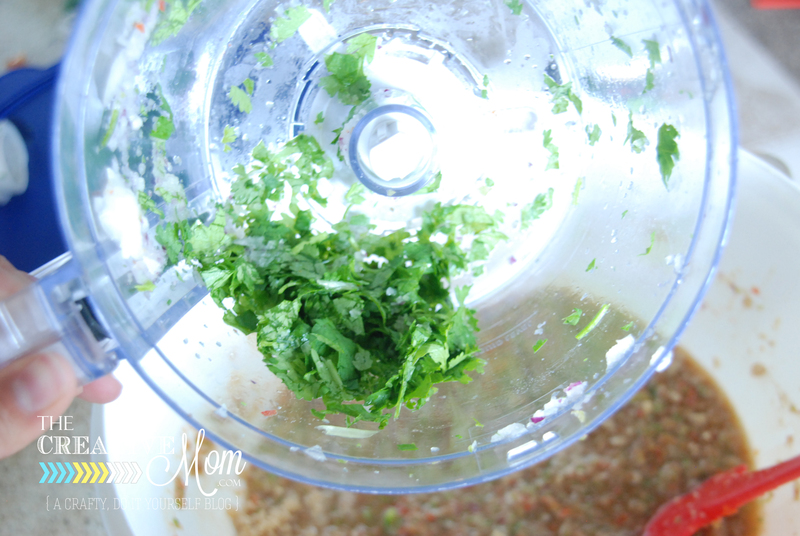 You can omit the cilantro, lime, sugar, and any of the spices. 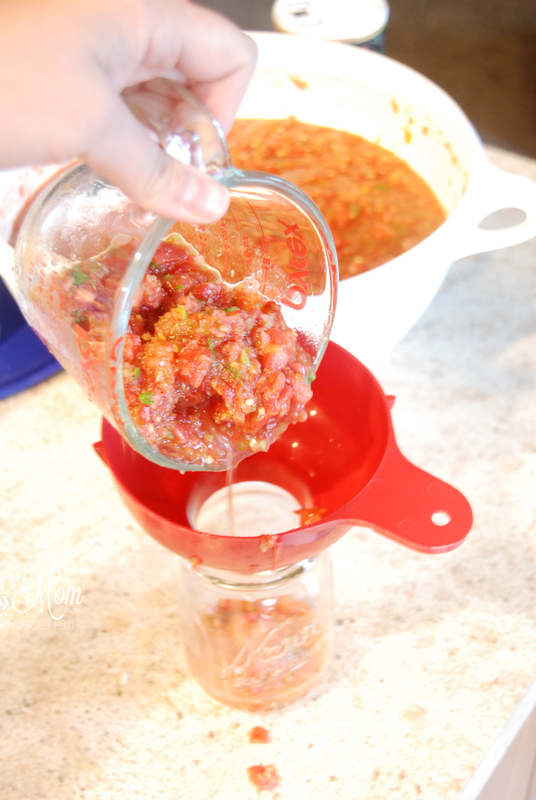 You can also add more or less tomatoes and peppers to adjust the spiciness of the salsa. Before you start mixing things up, get your jars out and start sanitizing them so they’ll be ready when you are. There are several ways to do this. I have found it’s easiest just to stick them in my dishwasher and push the sanitize button. Or if you don’t have a sanitize button, just run them through a really hot rinse cycle. 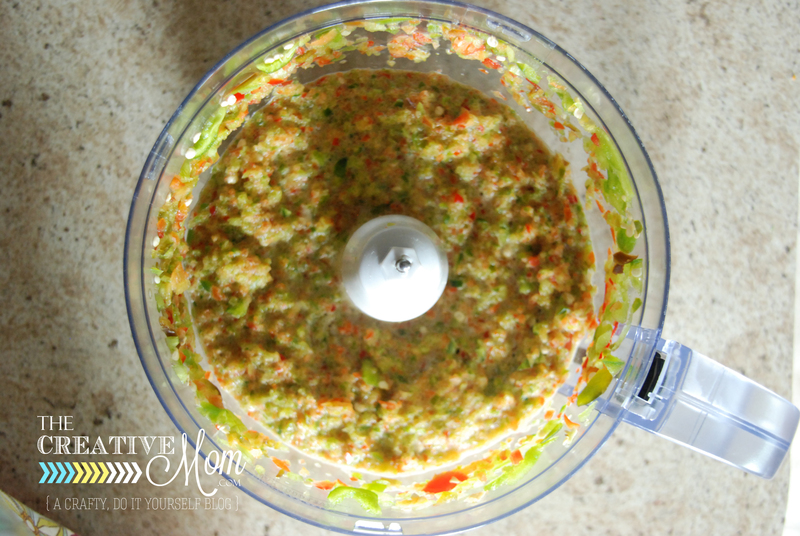 I use my food processor for a lot of the chopping. Mostly because once I touch a jalapeno, I can’t take my contacts out for a week! I am a wimp for spicey stuff, and I don’t want all that juice all over my hands. 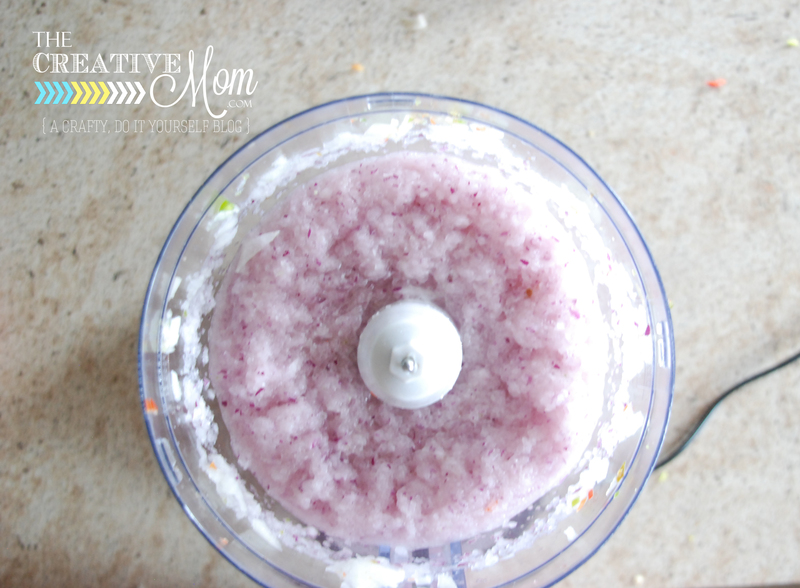 If you don’t have a food processor, try using the pulse setting on your blender, or just use an old fashioned knife and chop away! Start by chopping your peppers. I don’t like my salsa very chunky, so I gave it a GOOD chopping to get rid of any of those pepper chunks. You’re going to need a big bowl or pot to mix the salsa all up in. Next, chop the onions. I love the difference in color and flavor the red onion brings, so I used about half yellow onion, and half red onion. And I chopped it probably too much here. But it’s really up to you how chunky you want it. 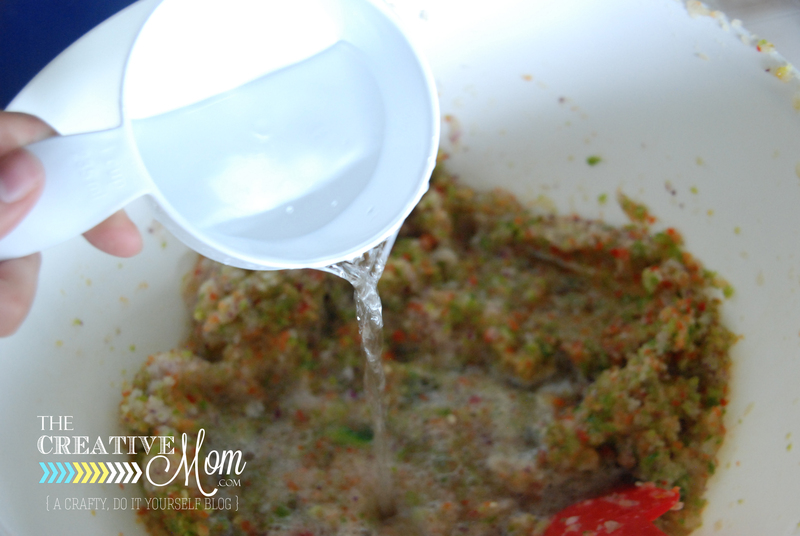 You will want to drain off any excess juice from your peppers and onions. This is already a pretty thin salsa, so if you don’t let the extra moisture run off, you’re going to end up with a REALLY runny salsa. 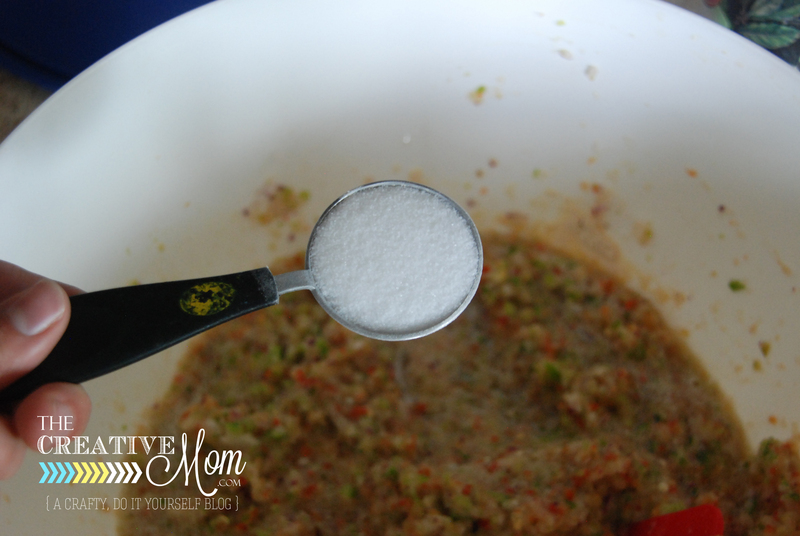 After you have your peppers and onions mixed together and drained, add your vinegar. You need your vinegar because it adds the acid for canning. If you are using this as a fresh salsa, I would recommend leaving the vinegar out. But if you’re canning it, keep the vinegar. Lime Juice and Cilantro are completely optional. Make sure to chop your cilantro before adding. I used about 35 large Roma tomatoes. Romas are the best because they are really meaty and not as juicy. But use whatever you have. You can add more or less, depending on how spicey and how tomato-y you want it. Take a knife and core the tomato. And then quarter the tomato. Then you’ll need to chop the tomatoes. Again, I used my food processor. You can do them as chunky as you like. After all, it’s your salsa! 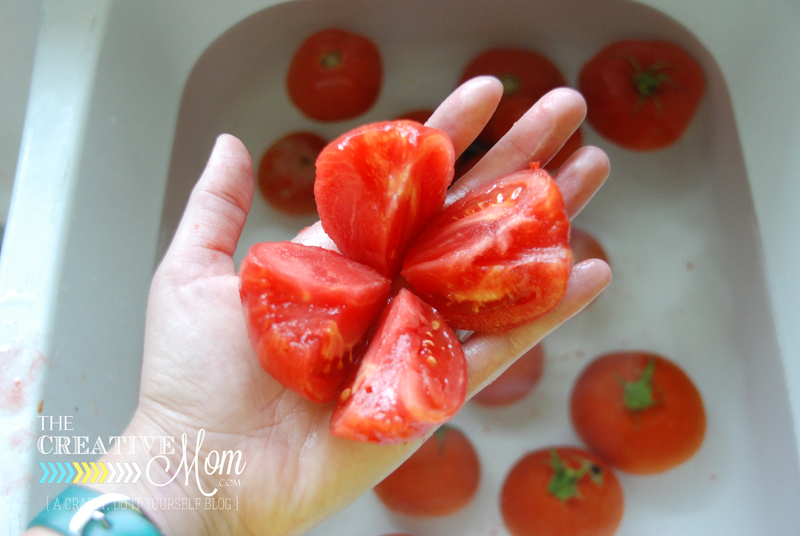 Take a strainer, and strain a lot of the juice out of your tomatoes. I do this because a lot of canned salsa recipes call for simmering the tomatoes for hours and hours so the juice cooks off. I don’t like the taste of cooked salsa, because I feel like it tastes more like a chili sauce than fresh salsa. So, since we aren’t simmering our salsa for this recipe, we’ll need to strain most of the tomato juice off. If you are using heartier tomatoes, like Romas, you won’t have hardly any excess juice. But if you use plump, juicy tomatoes, you’ll need to get rid of that extra juice. Add your tomatoes to your pepper mixture. Stir it all together and taste it. It should be pretty close to perfect, but you can adjust the heat by adding more tomatoes (for milder taste) or more jalapeno peppers (for hotter taste). Here’s my tip. Taste your salsa with a tortilla chip, because 99% of the time, that’s how I eat my salsa. If you are making your salsa to eat fresh, stop here. 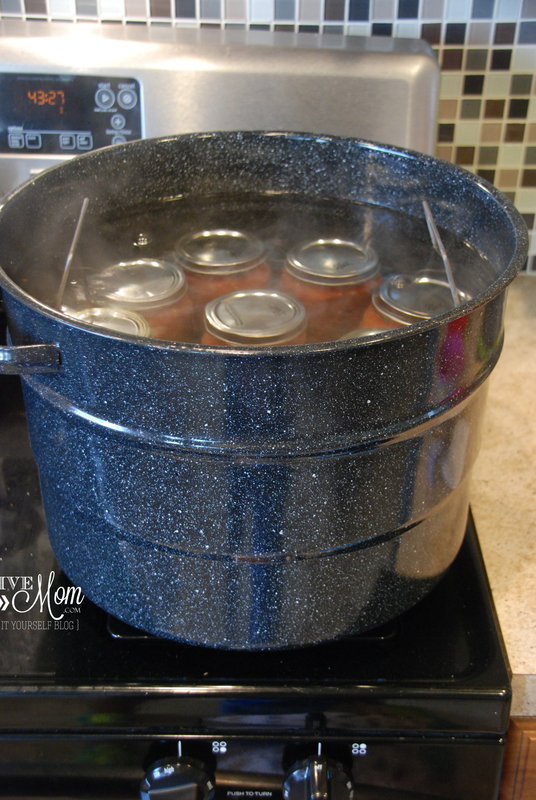 If you are canning your salsa, go to the next step. Fill up your pint jars with the salsa. A jar funnel is absolutely necessary to keep your jars clean. Make sure to get any air bubbles out of the jar. Simply run a butter knife around the inside of the glass until all of the air bubbles have escaped. Wipe off the mouth of the jar and put on your lid and ring. Place your filled jars into a giant pot of boiling water. 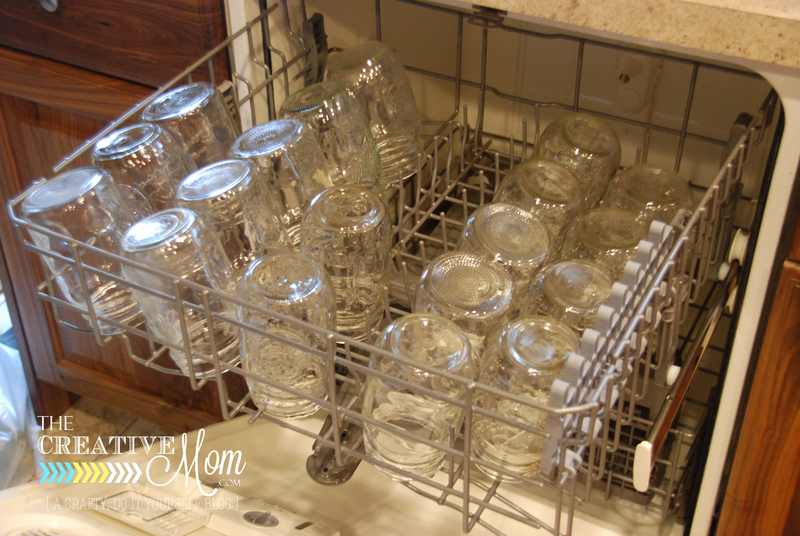 The water should be over the top of the jars by an inch or two. Boil for 45 minutes. I use this Water Bath Pot and it’s my very favorite ever! It has a rack so I can lift the jars out without burning my hands. I also have this canning kit, and it is SUPER helpful. If you don’t want to buy the whole kit, you’ll at least want a jar lifter and a jar funnel. After processing, let your bottles sit on the counter at room temperature. Check your bottles after 24 hours and make sure they have sealed. You’ll know they’ve sealed if the top of the lid doesn’t pop up and down when you press on it. 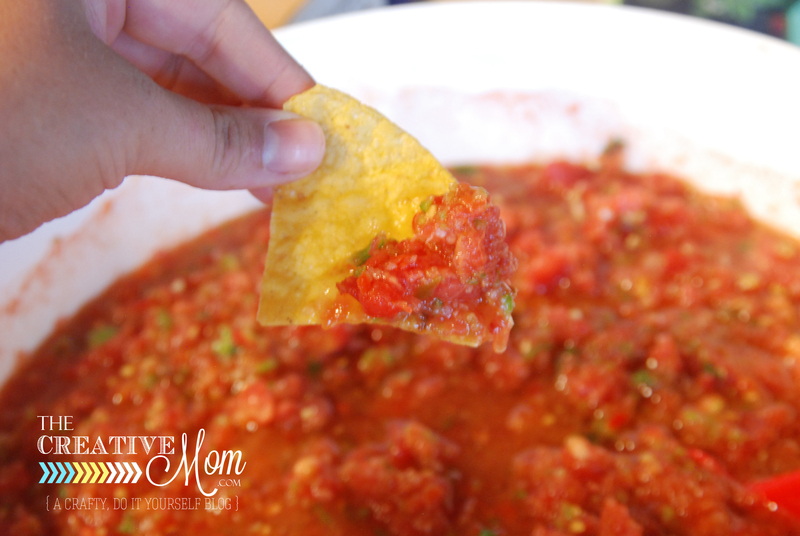 Don’t lose this salsa recipe like I did! You can pin this salsa recipe to your pinterest board, simply by hovering over the image above with your mouse and clicking on the “pin it” button that pops up.